Electrolysis vessel magnesium refinement is performed for a vast quantity of magnesium in the sea by geothermal energy use of the heat source burden of expense Zero. 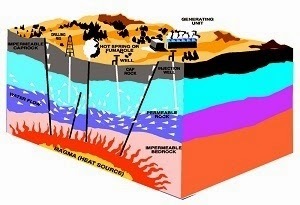 The magnesium lump of the enterprise concerned is a system plan which generates electricity by considering it as substitution exploitation of fossil fuel resources. The business investor concerned is looked for in the whole world. It is useful for global warming by the CO2 discharge Zero. 1) When industrializing, a patent fillings person (our representation) offers the system patent concerned, and it cooperates in the business with an investor. 2) It manages when industrializing by starting a project participating investing firm and a new SPC company (company name: undecided). 3) This business system performs a specification legal relation person (lawyer) presence contract by the existing technical use systematization based on a project participating company, the Japan internal dimensions, and an international applicable law, and it manages investment money in the appointed accountant's office. A receipt is published in an SPC company new at the time of investment money receipt. 4) This system enterprise does not stop in Japan, but it can use it for the "non-electric power" area in the world by the magnesium supply as resources for power generation in the future. 5) If there are a zone and the sea in a volcano, refinement is possible and it can supply magnesium very safe and cheaper than the fossil fuel of the present resources for power generation as a generating resource. 6) New industrial development other than power generation is realized with the refined magnesium. 2) The places which can be generated are a volcanic region facing the seashore of the Japan whole country, and prior Environment Agency approval necessity. 3) Refinement magnesium lump supply can be supplied overseas in Japan. 4) New exclusive plant development installation is possible at transportation of a refinement magnesium lump. 5) Power generation plant exports are possible in the non-electric power area in the world. 1) Based on the Japan internal dimensions and international law, both-companies relations are decided suitably [ according to / a legal basis ]. A contract term will be separately set after deliberations after that for ten years at the beginning. 2) A new business unit starts a business entity (SPC) specially separately after a contract. In that case, limited officer participation is possible. It consists of a patent donor and a business equity participant. Profits reduction is discussed and defined after industrialization in accordance with a contract.